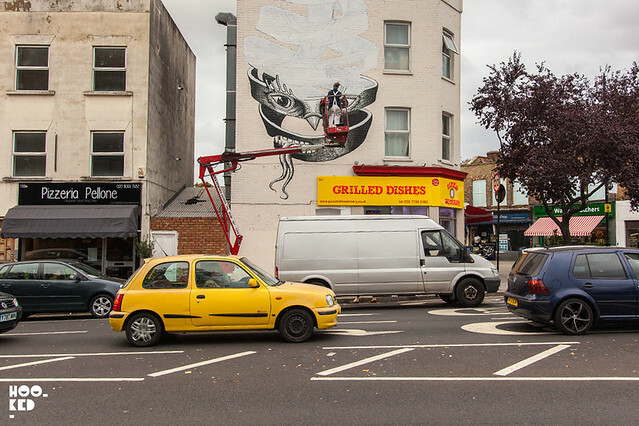 Back in October we jumped on the overland train and headed south to catch up with street artist Phlegm (Previously on Hookedblog) as he began working on a mural in Herne Hill just opposite the park with Dulwich Outdoor Gallery. We managed to catch a few work in progress shots but with a flight to catch to Milan we were unfortunately not around to see Phlegm finish work on his mural and we have only just found time to revisit the finished work since our returned to London. As with Plelgm's other works this piece has been painted in black and White colour with a cross hatching style effect that the artist has become know for making him the perfect choice for this commission. Based on a work titled 'Bond of Union' by Dutch master draughtsman M C Escher, a work which was part of The Amazing world of M C Escher exhibition held at the Dulwich Picture Gallery in South London. The exhibition saw the Dulwich Picture Gallery bring together a collection of Escher's work that made him one of the most famous artists of the 20th Century. 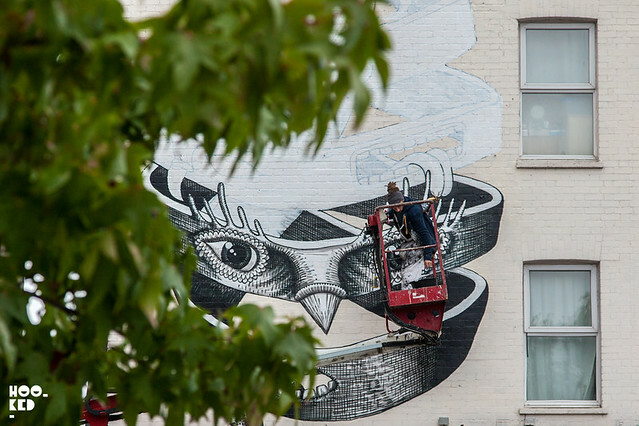 This wonderful mural is a welcome addition to the London street art landscape from Phlegm. 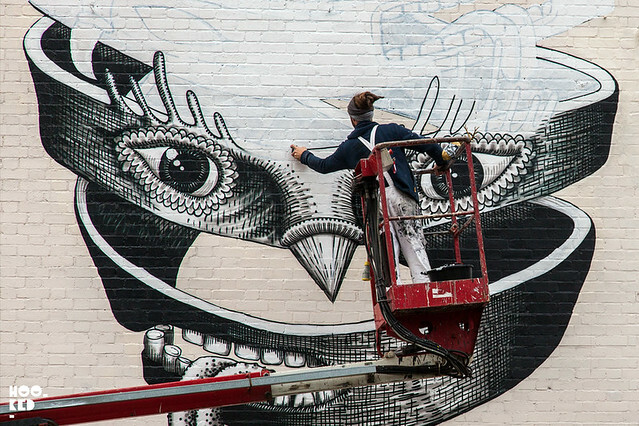 Follow our street art Pinterest Boards for even more from Phlegm. 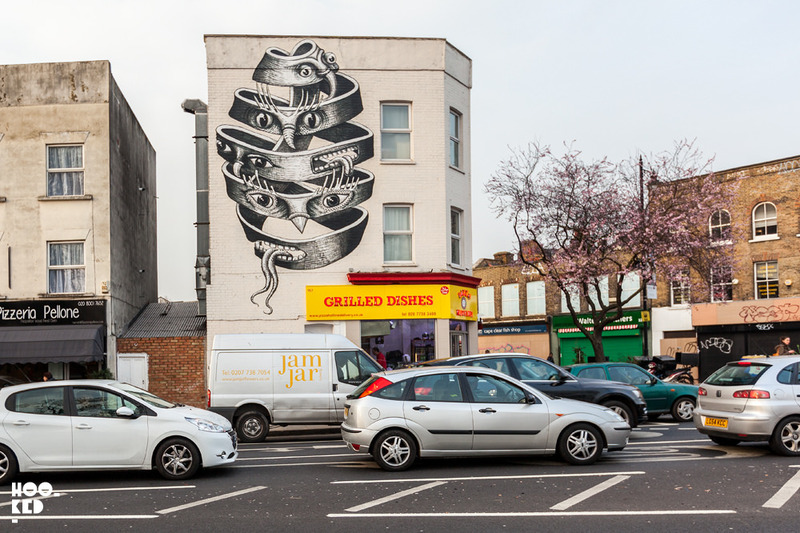 The mural from Phlegm is located on 155 Dulwich Road, opposite Brockwell Park in South London.